Cells and cell-derived reagents form the basis of an operationally challenging class of test methods used in execution of product potency testing (stability and lot release), assessments of pharmacokinetic/ pharmacodynamic (PK/PD) profiles, detection of antidrug antibodies (ADAs) or neutralizing antibodies (NAB), and characterization and comparability testing of biopharmaceutical products. Frequently, cell-based assays provide the only measurement of the tertiary/quaternary structure of each batch of product at the time of lot release and during stability testing to assist in determining product shelf-life. Cultured cells themselves are often used to generate monoclonal antibodies (MAbs), enzymes, or substrates for use as critical reagents in other types of tests, including ligand binding and enzymatic assays. In all these applications, the cells serve as highly critical, highly complex “reagents” that require distinct characterization and control measures to ensure operational consistency over time. Cells are sensitive to innumerable chemical and physical elements that can alter expression of their cellular proteome and change growth characteristics or responsiveness to ligands/biopharmaceuticals. Establishment and characterization of homogeneous, stable cell banks are necessary to ensure that starting cellular material for each assay is as consistent as possible. Appropriately established and stored master and working cell banks (MCBs and WCBs) provide a continuous supply of viable cells to generate accurate, reliable results within specified test methods or provide the cell-derived reagents used in those methods. Although the strategy for preparing cell banks is clearly defined by regulators for cells used to produce biotechnology products, it is less clear what strategies should be applied to cells that are used solely as part of analytical or bioanalytical test methods. An early FDA points-to-consider (PTC) guidance on characterization of cell lines for producing biologicals (1) outlined many MCB and WCB characterization requirements that were later adopted into ICH Q5D for production cell lines (2). But it is still common to find the phrase PTC testing used in relation to the list of tests applied to nonproduction cell banks even though that guidance was not intended to apply to such banks. In the absence of clarifying information about the significant differences in intended use between production cell lines and those used for analytical/bioanalytical methods, some laboratories choose to apply the entirety of the PTC guidance to both. Conversely, others fail to establish cell banks at all for analytical use, severely jeopardizing the desired state of assay control. The US Pharmacopeia recently published a suite of chapters — <1032> Development (3), <1033> Validation (4), and <1034> Assay Analysis (5) — providing guidance on good manufacturing practice (GMP) potency bioassays. Several paragraphs in USP <1032> provide a general outline for MCB and WCB preparation; however, specific details are not provided to assist laboratories with the less obvious but still critical aspects of creating, characterizing, and storing MCBs and WCBs. Recommendations presented herein support and significantly elaborate on principles noted in USP <1032> for establishment and characterization of mammalian and bacterial cell banks used to support analytical/bioanalytical testing. These approaches may also be extrapolated (when applicable) to include cells used for reagent production, for growing viruses used in test methods, and so on. These strategies represent our combined opinions on best practices in establishment, characterization, and maintenance of controlled and consistent cell sources using a risk-based and product-phase–appropriate approach. Each sponsor should determine which recommendations to adopt and when each will be performed based on the level of risk acceptable in developing and validating methods that use cells or cell-derived reagents. Before generating MCB/WCBs either for use in cell-based assays or for generating cell culture-derived reagents, consider the expected practices under which such laboratory work is done. As a part of quality-by-design (QbD) strategies being adopted for analytical test methods, reviewers and auditors are increasingly expecting to see MCB/WCB activities reported in (or linked to) method qualification and/or validation reports (6). Banking and characterizing cells is critical for designing quality principles into associated test methods. To support the objective of analytical QbD, it is thus recommended to include phase-appropriate MCB/WCB details in assay development, qualification, or validation reports that form the method’s life-cycle documentation. Such documents can be critical should a method change in performance through operational drift, technology transfer, or from changes to other critical assay components (7). The 1993 FDA PTC guidance on characterizing cell banks for biological production (1) indicates that tests performed to establish production MCBs/WCBs should be conducted under 21 CFR Part 58 good laboratory practices. Contaminated or unstable cell lines can have a major impact on patient safety through changes to expressed proteins, so it is reasonable to consider establishment of production cell banks to be covered by GLP regulations as are the viral inactivation/clearance studies performed in support of product safety (1). Because nonproduction cell lines used for bioassays never contact the product manufacturing stream, patient safety is not directly at risk from cell bank contamination. So this guidance does not directly apply to cell lines used only for analytical/ bioanalytical test methods. It is important to note here the clear distinction between work performed under GXP regulations and activities performed to achieve GXP compliance. For example, executing quality control (QC) release or stability testing of a product using a validated cell-based potency assay included in a product’s master specifications must be under GMP regulations as a part of laboratory controls (8). Similarly, using a validated cell-based assay for NAB testing as part of a GLP and/or good clinical laboratory practice (GCLP) protocol is done under GLP (9) or GCLP (10). By contrast, activities (such as cell banking) performed to generate the test methods that will be used as part of subsequent GXP testing are not subject to GXP regulation. So it is our intent to describe non-GXP best practices that can ensure that cell banking activities are performed and documented in a way that’s consistent with the future use of cells in GXP analytical and bioanalytical test methods. d the specific practices noted here for capturing details pertaining to the generation of cell banks intended for use as part of regulated studies or tests. We assume here that laboratory personnel involved in cell banking activities are skilled in standard aseptic cell culture techniques, that instruments used for measurement and delivery (e.g., pipettes, balances, pH meters, and spectrophotometers) are calibrated, and that all reagents and materials have been stored appropriately and have not expired. Procedures dictating establishment and use of the cell banks are assumed to be captured in controlled documents to be followed by trained laboratory personnel. GXP compliance is not a legal requirement to generate nonproduction cell banks; but use of proper documentation and best practices provides a high level of confidence in the continued performance of such cells over time. Our recommendations illustrate details of the technical, regulatory, and quality principles and practices that have been implemented successfully in major biotechnology organizations for establishing and characterizing MCBs and WCBs used in cell-based methods or production of cell-derived reagents. Sponsors should determine the best practices that minimize risks to their own programs and adopt quality systems that align with specific guidance provided to them by regulatory reviewers or inspectors for their products and laboratories. Cell-based assay development is an ongoing process divided into separate stages. This section is not meant to be a guide to bioassay development or validation — other references focus on the subject (1,3,4,11). Instead we highlight the role of cell banks in development of bioassays or production of critical reagents. Risk-Based Approaches for Initial Cell Characterization Before Banking: The extent of initial cell line characterization before cell banking should be risk-based depending on multiple factors, including the cell source, history, and documentation available. We recommend that lower-risk cells — obtained from reputable sources with available history and documentation — be minimally shown to be mycoplasma-free (if not already demonstrated by the vendor) using a fast technique (e.g., polymerase chain reaction, PCR), sterile in the absence of antibiotics, and responsive in the bioassay for which they will be used before banking. For higher-risk cells without history or documentation — or those with identity, species, activity, or sterility in question — it may be desirable to perform additional testing before cell banking. This should be considered case by case: e.g., species identification by isoenzyme analysis, verification of cell line identity by short-tandem repeat (STR) profiling, screening for adventitious agents, and PTC mycoplasma/sterility testing. Such methods may be considered en masse or individually to address specific risks and provide confidence before efforts are expended in generating a cell bank. In addition to cell-specific issues, other variables such as the intended use of a bioassay should be considered when determining the extent of initial cellular characterization before banking. For example, a more thorough knowledge may be desired for cells that will be used as part of lot-release assays during initial/early clinical development than for cells that will be used only as part of qualitative or characterization assays. This example highlights potential benefits of early characterization for a high-risk cell line with a risk-based approach: Cells were received in a regulated testing laboratory from an academic lab with the understanding that they were human cells transfected with a human receptor. They were certified sterile and mycoplasma-free and showed desired bioassay activity. A seed vial was propagated and banked, with successful method development and validation during phase 3 clinical trials. Isoenzyme analysis was not performed until just before commercialization, and results demonstrated that this cell line was of rodent origin because it expressed the transfected rodent receptor. Fortunately, adequate homology existed between human and rodent receptors, so that discovery had no negative effects on the bioassay’s intended, and the rodent cell line was accepted as the target cell. Had it been determined that these cells were a mixture of human and rodent cells, that outcome would have created a setback in product development because the situation would have been unacceptable. A heterogeneous cell population is in danger of causing bioassay drift and can lead to inaccurate results. Specificity demonstrated by testing similar yet functionally distinct molecules in the assay. Cellular response also can be verified by an orthogonal method as recommended in USP chapter <1032>. For example, if a bioassay endpoint is cell death measured using a surrogate metabolic viability stain (e.g., Alamar Blue from Promega), then a parallel method (e.g., counting cells by Trypan blue stain or apoptosis assessment) may be available to confirm. Such performance expectations can be relaxed accordingly for quantitative assays. Cell banking should be initiated once initial characterization and feasibility testing are complete. Figure 1 outlines a recommended flow pattern for preparing most MCBs and WCBs. Additional method development using cells other than those from working cell banks should be approached with caution. We recommend against it because such cells are not used for long-term method performance. Starting Vial Prerequisites: Cells in a starting (seed) vial or vials used in cell bank preparation should be identical to those tested in feasibility studies. If this is impossible, then a vial of cells as similar as possible to the feasibility vial should be used after confirming cellular activity in the assay as well as a lack of contaminants. Document vial provenance, lot number, passage number, and all available history. ell banks that will provide consistent performance over time. Immortal Cells: Growth of adherent mammalian cells is relatively easy to manage through visual observation of confluence at early stages to ensure that they do not become overgrown. Suspension cells tend to do well when maintained between 1 × 105 and 2 × 106 cells/mL; however, such densities should be determined for each cell line by growth-curve analysis to ensure that no stressed population is used for cell banking. Identify a proven density-based subculturing schedule that consistently splits cells to yield healthy cultures two to four days after the split and maintain over cell passages for both adherent and suspension cell lines. For long-term use, acceptable viable cell density (VCD) and viability ranges at harvest should be determined empirically rather than by visual observation. Do not use cells that are starved, overcrowded, appearing atypical, or showing low viability (typically <90%) during the banking process. Strategies to reduce labor by plating cells at low densities can stress cell populations. Sterility of all media and reagents (e.g., trypsin and freezing media) is paramount during cell banking. We recommend that such reagents be used either from newly opened bottles or sterile-filtered immediately before use as appropriate. Cells should not come into contact with antibiotics, which can mask subliminal infections that might lead to unwanted shifts in cellular characteristics (e.g., growth and responsiveness). However, it is acceptable to propagate/bank stably transfected cell lines in media with selection antibiotics. The DNA of genetically modified cells should be properly verified by PCR and/or Southern blots before and after the banking process. Primary Cells: When no transformed cell line is appropriate for use, primary cells (either procured in-house or from outside vendors) may be required. These cells present a number of well-documented challenges for long-term use and/or cell banking: lot-to-lot variability, limited availability from a given lot, and narrow passage limits of cellular responses. Many primary cells require complex cocktails of growth factors for optimal propagation, which makes troubleshooting changes in growth or performance patterns problematic. Before procuring a batch of primary cells for long-term use and cell banking, consider your choice of vendor, whether to use cells from a single donor or a mixed population, and the donor demographics. For many primary cell lines, the passage/doubling windows are limited, with some cells remaining useful for as few as two or four passages. In such cases, preparation of a WCB may be less useful (or impossible), and vials attained from a single lot may be designated the MCB. All subsequent cell-bank characterization work would then be performed on the MCB, and subsequent lots could possess dissimilar growth patterns and other problems due to donor variability. That could necessitate additional characterization/optimization to ensure assay performance. For primary cells that retain activity over a broader range of passages, a WCB may be prepared and characterized in accordance with practices detailed herein. When choosing a lot of primary cells for long-term use in an assay, we recommend obtaining multiple lots of cells from a vendor and initiating them in culture simultaneously. The VCD of those lots should be monitored at the time of initial subculturing, and it may be desirable to eliminate slow-growing cell lines early on because they are unlikely to provide sufficient cells for routine use. Remaining cell lines should be tested for response over a defined number of passages. The performance of cells with a narrow range of useful passages should be monitored over the entire predicted passage range to ensure consistent performance. Some batches could perform well early on and then fall off over subsequent cell passages. Once the choice is made, obtain a suitable number of vials to allow for long-term assay performance. At this point, it is critical to continue trending multiple aspects of cell performance — including cell density and viability as well as assay-related parameters (e.g., asymptote values, EC50/IC50 values) — from resultant dose–response curves. Together, the resulting data will provide real-time information about the health of a cell bank as well as baseline information for comparing subsequent cell batches. After a batch of primary cells is procured, growth and subculturing conditions should be optimized and characterized according to guidance provided herein. It is not uncommon for the harvest density of primary cells to affect not only the results of the next assay in which they are used, but also for subsequent assays. That may compromise the performance of an assay and require initiation of a new vial of cells. Such evaluations should take place for each new lot of cells obtained to verify that chosen culture conditions hold true and that assay performance remains unaffected. Freezing Cell Banks: For mammalian cell banks, you can feed flasks of adherent cells demonstrating ∼75% confluence the night before banking them, then dissociate them on the day of banking according to standard tissue culture practices. Suspension cells can be fed at ∼50% of their maximum allowable density the day before banking because they generally grow faster than adherent cells. Concentrate cells with a centrifugation step (should be as gentle as possible and not exceed 400g), then resuspend them in an ice-cold mixture typically combining dimethyl sulfoxide (DMSO) and fetal calf serum (FCS). For example, a typical freeze medium consists of a cell culture medium containing 10% DMSO and 20% FCS, but other ratios of DMSO to FCS may prove optimal for certain cells. Some cells (e.g., hybridomas) require a freezing medium consisting of 10% DMSO and 90% serum. Cells maintained in serum-free conditions would require an alternative protein such as recombinant bovine serum albumin (rBSA) in place of serum. Still other cell lines require a freeze medium that is completely free of animal proteins. Premade commercial freeze media are available; however, apart from convenience, significant advantages over the basic formula have not been observed with most cells. Five million cells per milliliter per vial typically provides for healthy recovery upon thaw, but lower cell densities (e.g., 2 × 106 cells/mL/vial) could be acceptable for sturdier cell lines (e.g., tumor cells). Freezing cells at 1 × 106 cells/mL/vial or less can be risky unless preliminary studies demonstrate good recovery with that particular cell line. Maintain cold freeze media along with gentle mixing of cells to prevent settling during the banking process and ensure consistency from vial to vial. Label (or barcode) an appropriate number of vials with accurate information using liquid nitrogen (LN2)-resistant labels and solvent-resistant ink before cell preparation. Information on each label (or linked to each barcode) should minimally include a unique protocol number or other traceable reference, the name of the cells and the date they were frozen, passage number, bank type (MCB or WCB), vial number, the number of cells per vial, and the analyst’s initials. rs — and may work better with certain cells (e.g., purified blood cells). Controlled freezing is becoming more common in the industry; however, both methods can be used with success. As necessary, testing a limited number of cell vials for recovery can confirm that conditions (freezing media, procedure, and cell density) are acceptable. MCBs should contain a minimum of 50 vials to prevent changes in bioassay performance from creating a new MCB if the original one was too small and is used up. Consider MCBs with significantly more than 50 vials carefully because the longer a cell banking procedure takes, the greater the risk of contamination to the cell bank. Once your MCB is frozen, we advise thawing some vial(s) and testing for sterility/mycoplasma. You may also want to confirm the activity of your thawed cells in the relevant bioassay(s) to demonstrate that they still respond to the ligand/biopharmaceutical and have not been compromised by the freezing process. Start a WCB from a frozen MCB vial with 50–200 vials, depending on the particular cell requirements of your analytical method. It is typically unnecessary to make extremely large MCBs and WCBs with significantly more vials than recommended above. For example, assuming a 50-vial MCB and a WCB with 100 vials of a cell line that is suitable for up to passage 30, and assuming the cell line is subcultured three times per week, then a single WCB of 100 vials would theoretically last 19.2 years (not taking into account other uses, such as sterility testing). After freezing, vials from a WCB also should also be thawed and tested accordingly. We recommend preparing new cell banks when 15–20% of the vials from an older cell bank remain available. Preparation of new WCBs should adhere closely to the conditions documented for generation of the previous WCB. Parallel studies using vials from both cell banks should demonstrate comparable growth characteristics and activity in the bioassay. 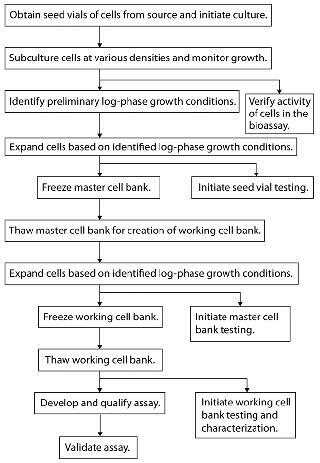 For bacterial (microbial) cell banks, thoroughly document the cell culture pedigree and culture expansion and maintenance conditions used before establishing a cell bank. Add a sufficient aliquot of seed bacteria to broth so that enough bacteria will be ready for banking after <24 hours in culture. Before banking, microbial cells should be characterized for their identity (species, strain, genotype, and phenotype), purity, viability, and function in the intended bioassay. Bacterial stock is concentrated and aliquotted into several hundred vials and then frozen at −80 °C or lower in a freezing medium that is optimal for the particular strain. One vial is thawed and titrated to the concentration that provides the best assay result. That dilution (titer) is documented and typically used throughout the lifetime of a particular set of aliquots in a given bank, assuming that the bank is confirmed to be stable in long-term storage. The long-term stability of bacterial cell banks must be evaluated for each strain with the specific cryopreservation medium used (12,13). At predetermined intervals, remove a vial from the bank, then revive the cells and retest them for viability, percent recovery, purity, and function in your bioassay to confirm that the critical properties of the bank remain constant. If bacterial cells require de novo transformation for use in a bioassay, it may be suitable to generate one MCB consisting of several hundred vials. At time of use, one vial is revived to be subjected to further treatment before use and to provide the working cells for the assay. If those cells are used as is (no subsequent transformation steps, just expansion in culture), it is typical to generate a MCB with multiple dozens of vials. The number of vials for each WCB should be determined based on the amount used in each bioassay run and the number of runs expected over a given period. For assays that require many cells per run and are run many times each month, several hundred WCB vials may be needed. For those using minimal numbers of cells and/or run infrequently, several dozen WCB vials may be sufficient. The approach to viral banks (outside the scope of this discussion) is a hybrid of the above. Mammalian host cells need to be healthy and confirmed free of contaminants, then incubated with pure virus under conditions that will yield high titers. One vial of virus should be thawed and titrated, and a titer should be assigned to the particular bank. As with bacterial cells, normally just one bank is prepared because several hundred vials typically can be prepared from one harvest. A specific guideline to generating these banks has recently become available (14). Report format (certificate of analysis or text report). The methods section should include references to relevant internal and external standard operating procedures (SOPs) or protocols for methods to be used, including sterility, mycoplasma, and other qualification and characterization assays. It should also reference a protocol for a confirmatory bioassay that tests the cells’ ability to respond to the biopharmaceutical of interest, and that protocol should be as specific as possible (15). This section should also document all activities that will be undertaken in preparation of a cell bank (e.g., instruments, reagents, and subculturing procedures). This documentation should include sufficient detail to ensure future preparation of an identical WCB from another MCB vial. MCB/WCB Use During Method Development: In certain instances (e.g., due to time constraints), the MCB may be used for early assay development until a suitable WCB has been created and a vial thawed for use. All work performed as such is done at risk because the MCB will not be the final source of cells used in the method. Final assay development and qualification activities should use cells from a WCB deemed viable and contaminant free. Use WCB vials to support all method qualification and validation activities as well as sample testing. Such an approach is critical especially for executing experiments geared toward sustaining assay reproducibility dependent on cell maintenance and standardized preassay conditions. Optimization generates data to support cell passage numbers suitable for use with the assay. Cell banks are stored either in LN2 freezers or mechanical freezers. Here’s some practical information about minimizing risk and maintaining cell banks throughout a product’s life cycle. Log-In Process: Chain of custody for cell bank vials and proper documentation on the status of those vials are critical. Redundancy is key to proper storage of cell banks. Vials should be logged in by trained personnel and ideally tracked using suitable software. We also recommend a back-up hard-copy version of the container format used showing the visual position of each of vial in storage. should also have a procedure to manually confirm LN2 levels periodically, with weekly or biweekly checks recommended. Ideally, all freezers (including −80 °C freezers for bacterial storage) should be connected to an appropriate monitoring system that automatically alarms staff when temperatures deviate and provides a permanent record of temperature changes. Storage of cell banks in more than one freezer is also recommended to minimize risk of a catastrophic unit failure. Mechanical Freezers: An alternative to LN2 storage is a mechanical −150 °C freezer for long-term maintenance of cell banks. Mechanical freezing provides a generally uniform temperature, whereas LN2 units can have temperature gradients when refilled with LN2. Mechanical freezers require no LN2 or related level monitoring. As with all equipment that stores critical material, however, temperature monitoring and a back-up freezer and generator are essential in case of a mechanical malfunction or power failure. We compared the long-term performance of cells stored in LN2 with those stored in a −150 °C mechanical freezer using WCB vials of transfected, immortalized mammalian cells. We evaluated cell viability and performance monthly for a year. The average percent-viability range was higher for the mechanical freezer (93–98% viability with a mean of 96% for mechanical freezing; 67–95% viability with a mean of 86% for LN2). A trend toward lower viability was evident in the LN2 freezer over time. Mechanical freezers thus offer another option for cell-bank storage without a need to monitor LN2 levels over time or contend with temperature fluctuations during LN2 addition. Given the variability of individual cells and freezer units, we recommend a controlled comparison before committing to a storage option for critical cell banks. Regardless of the freezing system you choose, have an alarm system in place to alert personnel of temperature excursions in near real-time. We recommend that all cell banks be stored in two independent freezer units, with one or two boxes containing representative vials of all banks forimmediate recovery in the case of a freezer malfunction that compromises cell bank integrity. Timing and extent of MCB and WCB testing and characterization should be risk-based and phase-appropriate. In general, initial cell bank testing follows the risk-based guidance provided above, whereby minimal requirements include fast mycoplasma testing, preliminary sterility testing without antibiotics, and cell responsiveness in a bioassay (Table 1). Additional testing may be considered depending on a given cell line’s history (or lack thereof) as well as the phase of clinical development, site-specific policies, and where the assay will ultimately be performed. Different CROs and CMOs can have different requirements for accepting cell lines into their facilities. Determine the actual timing and performance of cell bank characterization activities taking into consideration industry best practices and your internal policies, with regulatory input. More thorough up-front testing can reduce risk later on, but costs, resource constraints, and drug candidate attrition rates also should be considered when deciding on a characterization strategy. Regardless of risk level, however, appropriate and sufficient cell bank characterization should be performed by the time of commercialization. Purity: Biological purity is critical. Best practices for cell culture work should be observed at all times to minimize or eliminate the risk of cross-contamination. We recommend use of a dedicated biosafety cabinet for each cell line during purity testing, although that will not always be practical or possible. ICH Q5D recommendations for manufacturing processes indicate that 1% (or a minimum of two vials) of each cell bank is selected for purity testing. The testing program for nonproduction cell banks should be designed with the understanding that bioassay cells will not require the full panel of tests indicated for production cells. Selection, timing, and the number of vials and tests should be logical and risk-based. Many bioassay laboratories send cell banks to outside vendors for purity testing, and numerous labs offer validated and customized approaches for this purpose. Minimally, cells maintained in the absence of antibiotics should show no evidence of contamination after several days in culture. A simple in-house sterility test can be performed to support initial characterization by growing cultures in the absence of antibiotics for several days. After adding an appropriate volume of cell-free supernatant from cultures to commercially prepared test tubes containing tryptic soy broth, incubate for the recommended period (typically ≤7 days) at 30–35 °C and 20–25 °C according to product instructions. Lack of turbidity and absence of microscopic contamination provide evidence that the culture is free of bacterial or fungal contamination. As deemed necessary, you can more thoroughly test against anaerobic and aerobic bacteria as well as fungal contaminants using the two-media fluid thioglycollate and soybean casein digest method described in USP <71>, 21CFR 610.12, EP 2.6.1, and JP 4.06. For mycoplasma testing, a number of commercial kits are available for in-house use (16). Current commercially available quantitative PCR (qPCR) kits can detect >90 species of mycoplasmas and provide enough certainty to initiate cell use. Usually, the presence of antibiotics in culture media of cells being propagated for mycoplasma testing is contraindicated for optimal performance and sensitivity of the assay method. To ensure analyst safety, specific viral testing is performed as appropriate on cell lines known to harbor harmful viruses. Viability is a critical parameter, not only for cell banks but also for associated bioassays. It is optimized during development, defined during validation, and checked before each sample analysis. High cell viability (target >90%) is a minimum recommendation for reproducible and consistent bioassay outcomes. Cell viability is traditionally tested with the trypan blue dye-exclusion assay using a light microscope and hemocytometer. In recent years, automated cell viability analyzers have become common in cell culture laboratories. A typical automated analyzer uses a liquid-handling system for sample aspiration, reagent handling, and subsequent instrument cleaning in two to three minutes per sample. Aspirated sample is mixed with trypan blue and pumped to a flow cell for imaging. Software automatically generates percent-viability, size, and total cells per milliliter based on real-time cellular imaging. All data points are electronically recorded for future reference. onvenient, objective, and statistically reliable cell counts compared with manual counting by analyzing large numbers of samples for activities such as cell growth characterization. Take care, however, to ensure proper calibration and comparable results from different instruments even if they are the same model from the same vendor. Growth Characteristics: Because each cell-based method is unique, growth characteristics should be optimized for each cell line during the early stages of assay development. Parameters commonly evaluated include seeding densities used for subculturing, detachment methods for adherent cells, growth rates, population doubling times, and optimal media components. For assays that depend on a particular phase of growth (G1, S, G2, and M), optimization is critical to the performance of the method. To determine cell growth and doubling time, thaw and culture cells in appropriately sized tissue-culture flasks. Typically, these parameters are determined by cell counts after culturing cells for a range of incubation times. Cells are initiated at low density (e.g., 1 or 2 × 104 viable cells/mL) and then counted every 24 hours for a minimum of 96 hours. Growth rate (µ) is defined as in Equation 1, where N is the cell count at a given time point, (N0) is the initial cell count at the start of the growth curve, and T is the time cultured in hours. Cell doubling time (tD) is calculated at each time point of the growth curve and expressed as hours/division (Equation 2). In calculating doubling time, it is important to determine this value in the log phase of the growth curve. Understanding cell growth rates early in bioassay development will benefit long-term cell maintenance and help identify counts that are out of the expected control range. Specific to WCBs, detailed cell growth analysis (growth curves) should be performed. Continued correlation of cell growth parameters with trended data from assays can be used to identify optimal cell densities and passage ranges for cells used in a given assay. Morphology: Visual observation and/or immunohistochemical analysis can provide important insight into cell morphology and should be routine at each subculturing or use of the cells. Many laboratories maintain photomicrographs for visual reference. Additionally, some automated cell analyzers store pictures and information on aspects such as cell diameter that may be useful for future reference. Analysts should be trained to objectively identify deviations from the norm and report them to appropriate management. Identity: The species of origin for a given cell line can be determined using isoenzyme analysis, whereby specific electrophoretic patterns are obtained from certain enzymes as they migrate through a gel (17). Cell line identity may be verified by short tandem repeat (STR) profiling. Recently, the American Type Culture Collection (ATCC) established a working group consisting of people from industry, government, regulatory agencies, and academia to provide recommendations for verifying the identity of human cell lines using STR technology. The goal is to create an interactive database that can be accessed to verify results from STR profiling (18). By combining isoenzyme and STR analyses, you can verify both the species and identity of a given cell line to reduce or eliminate the potential for misidentification. Cell Bank Stability: Control charts (trended data) should be maintained to monitor a cell bank vial in use, the passage number of the cells inside it, their viable cell density and/or percent viability, and performance of the associated bioassay. Keeping track of cell-line–specific performance-indicating factors can help you quickly identify a trend that truly indicates stability loss rather than just an aberrant situation. Protein production and quality should be monitored for cells that produce critical reagents. Analysis of endogenous and exogenous receptor and target expression can play a role in cell bank characterization by helping you ensure consistent assay performance over time. 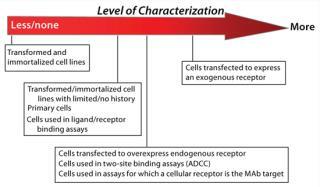 A decision to assess receptor expression (and the degree to which receptor expression is characterized) depends on a number of factors: source/supplier of the cell line and whether cells are primary, transformed, or transfected and expressing or overexpressing exogenous or endogenous receptors or targets (Figure 2). You may also need to consider the mechanism of action for the therapeutic in development — for which a cell line will be used as an analytical tool — as well as the bioassay’s dependence on receptor expression patterns. If a receptor-specific probe is unavailable (or flow cytometry support is impossible), performance of a cell-based assay may be the only tool available to verify and monitor receptor and cell responsiveness over time. Receptor expression may be assessed qualitatively by flow cytometry if necessary to ensure the presence of a receptor of interest. This can help verify uniformity of receptor expression in a cell population before initiating cell banking efforts. Cell lines with low or no expression of that receptor (or with expression patterns that contradict historical data) should be evaluated for responsiveness before initiating assay development and cell banking efforts. And cell lines with subpopulations of cells whose levels of receptor expression differ should be monitored for changes in responsiveness over time. Consider subcloning as necessary to obtain a uniform population of cells. If desired, quantitative receptor expression analysis can be performed easily with commercially available kits. They quantify the expression of cellular receptors with available monoclonal antireceptor antibodies. For cell lines that could benefit from quantitative receptor expression analysis, we recommend determining receptor expression at a number of cell passages to characterize the expression patterns. Ideally, cells used for this analysis are tested simultaneously in their associated bioassay to make real-time correlations between receptor expression, assay performance, and responsiveness to the biopharmaceutical. Source of Cells: The decision to perform receptor expression analysis — and the extent to which it is carried out — should be appropriately risk-based (Figure 2). Initial receptor expression analysis and verification for low-risk cell lines before MCB creation can include simply testing cells for responsiveness to the assay ligand. Receptor expression analysis for higher-riskcell lines will more commonly take the form of qualitative and/or quantitative flow cytometry. Here we assume that flow cytometry will be used to assess receptor expression and provides suggestions for its effective use. Detachment of Cells for Analysis: Commonly used methods to detach cells (e.g., enzymatic treatments and scraping with a sterile spatula) should be evaluated early for their effect on the receptor. For example, using transfected human melanoma cell line A375, flow cytometry results at Biogen Idec showed that transformed cells detached with trypsin had 96% positive staining for cells-surface receptor compared with 81% after versene treatment. Other factors such as time and temperature of enzymatic incubation also should be carefully evaluated for their effects on receptor and bioassay. Recombinant trypsin is commercially available to provide consistent activity and has been used successfully at Life Technologies for receptor expression studies. Primary cells possess variable receptor expression patterns depending on many factors: age, gender, and race of the donor; whether cells come from a single donor or a pooled population; and differences in cell isolation, propagation, and cryopreservation across different vendors. These cells often have passage/population-doubling restrictions that limit or prevent the creation of WCBs, so all characterization must be performed on the MCB. Because primary cells from individual donors and pools are not widely available, only a limited number of vials may be obtained for establishing an MCB of primary cells. That limitation is likely to necessitate more frequent qualification of new batches of cells than for other cell lines, making cell bank characterization critical for qualifying those new batches. Background knowledge of receptor expression patterns can assist in early decision-making in choosing a replacement cell line if the level of receptor expression is correlated to cell-line performance. During initial screening of primary cell batches for creating a new MCB, receptor expression analysis can help eliminate potential donors that differ significantly in their receptor expression profiles if those profiles correlate with assay performance. Transformed or immortalized cell lines propagated under optimal cell culture conditions typically are less likely to change their receptor expression patterns over time. The level of receptor expression analysis performed on transformed/immortalized cell lines should be dictated by the amount of history and documentation available for a given cell line. For low-risk lines, minimal (or no) receptor expression analysis may be deemed necessary; simply testing cell responsiveness in the associated bioassay may verify receptor presence. By contrast, the WCB for higher-risk cell lines that are induced to change their phenotype or receptor expression — or those for which significant changes in receptor expression are reported over time — may be monitored over time. Resulting data compared with assay performance will help you identify trends that can predict or explain future assay performance. During such studies, cell culture conditions can generate maximum consistency of receptor expression and cell responsiveness over time. You can define those conditions by correlating trended receptor expression results and/or assay performance. Transfected Cell Lines: Whether a cell line is transfected to overexpress an endogenous receptor or express an exogenous receptor, we recommend analysis of receptor expression to characterize genetically modified cell lines. For transfected cell lines, it is typically performed as part of clonal selection after transfection to ensure desired target expression. Established WCBs for transfected cell lines can be monitored for receptor expression over time and the results correlated with bioassay activity to further characterize the activity of the cells over time. The modified DNA also should be confirmed using appropriate molecular techniques such as sequencing, PCR, and Southern blots as well as phenotypic expression. Documentation for each MCB and WCB should be maintained separately to avoid confusion. The SOP or protocol for an assay using a particular bank should state the procedures for thawing and maintaining cells and describe passages recommended for use. Early Reporting: Summarize the initial documentation for your cell bank in a certificate of analysis (CofA) or similar document for future reference (Table 2). We recommend including a unique protocol number and data reference with the name of the cells and cell bank type (MCB or WCB), passage number, and the date they were frozen. Table 2: Example of cell bank documentation for early development phase. Names and addresses should be listed for both the sponsor and (if outsourced) the company that prepared the cell bank. A data reference can provide information about cell bank preparation and testing, numbers of vials prepared and cells frozen per vial, the freezing medium, and the location of vials in frozen storage. Sterility, mycoplasma testing, and a draft confirmatory bioassay should be referenced, with results and test dates. Phase 3/Commercialization: A bioassay undergoes full validation during phase 3 in preparation for commercialization. Relevant final characterization of cell banks should be complete and fully reported during this time (Table 1). Such information should be documented to support use of a cell bank as a well-characterized critical reagent throughout the product life-cycle, with continued data trending. Many factors, both obvious and subtle, can affect the reliability of cell-based assays and other methods that incorporate critical reagents derived from cell culture. Meticulous detail in method protocols, rigorous analyst training, conscientious instrument calibration, and high-qualitygeneral laboratory operations are all critical to minimizing cell-based assay failures. None of those activities, however, can ensure method accuracy and precision if the starting cell bank is contaminated, unstable, or inconsistent. Lack of control over the cultures that form the foundation of an assay (or that provide critical reagents) will inevitably lead to performance problems in the assay itself. Ultimately, individual sponsors are responsible for developing their own strategies regarding the level of characterization and the rigor of cell bank testing performed based on risk, pertinent internal policies, and regulatory input. The strategies presented here have proven successful for supporting development and validation of methods used in product testing and laboratory studies to support a number of GXP applications. So they should provide useful general guidance for generating and maintaining these types of cell banks. , PhD, is senior CMC consultant for Biologics Consulting Group, 400 North Washington Street, #100, Alexandria, VA 22312; 1-240-372-4898; nritter@bcg-usa.com, www.bcg-usa.com. Jonathan Zmuda, PhD, is associate director of R&D for Life Technologies. Darshana Jani is translational medicine manager, and Jaya Goyal, PhD, is principal investigator in translational medicine, both at Biogen Idec. 2.) Q5D ICH: 1998. Derivation and Characterization of Cell Substrates Used for Production of Biotechnological/Biological Products. US. Fed. Reg. 63:50244-50249. 3.) USP <1032> 2010. Development and Design of Biological Assays. Pharmacop. Forum 36:956. 4.) USP <1033> 2010. Validation of Biological Assays. Pharmacop. Forum 36:986. 5.) USP <1034> 2010. Analysis of Biological Assays. Pharmacop. Forum 36:1005. 6.) ICH Q8(R2): 2008. Pharmaceutical Development. US Fed. Reg. www.ich.org/fileadmin/Public_Web_Site/ICH_Products/Guidelines/Quality/Q8_R1/Step4/Q8_R2_Guideline.pdf 71. 7.) Ritter, NM, and M. Wiebe. 2001. Validating Critical Reagents Used in CGMP Analytical Testing: Ensuring Method Integrity and Reliable Assay Performance. BioPharm:12-21. 8. )Stability Testing: Testing and Release for DistributionUS Code of Federal Regulations Title 21, Part 211.165, US Food and Drug Administration, Rockville. 9.) Good Laboratory PracticesUS Code of Federal Regulations, Title 21, Part 58, US Food and Drug Administration, Rockville. 11.) Rieder, N. 2010. The Roles of Bioactivity Assays in Lot Release and Stability Testing. BioProcess Int. 8:33-43. 12.) Meza, RA. 2004. Study of the Stability in Real Time of Cryopreserved Strain Banks. Universitas Scientiarum, Pontificia Universidada Javeriana 9:35-42. 13.) Gilliland, SE, and ML. Speck. 1974. Relationship of Cellular Components to the Stability of Concentrated Lactic Streptococcus Cultures at –17 C. App. Micro. 27:793-796. 14.) Technical Report 47: 2010.Preparation of Virus Spikes Used for Virus Clearance Studies, Parenteral Drug Association, Bethesda. 15.) Menendez, AT. 2009. Accelerating Bioassay Transfer in a GMP Environment. BioProcess Int. 7:26-33. 16.) Duguid, J. 2010. Top Ten Validation Considerations When Implementing a Rapid Mycoplasma Test. Am. Pharmaceut. Rev.:26-32. 17.) Nims, RW, and CJ. Herbstritt. 2005. Cell Line Authentication Using Isoenzyme Analysis. BioPharm Int.. 18.) ATTC 2010. Standards Development Organization Workgroup ASN-0002. Nat. Rev. Cancer 10:441-448.